This year, we’ll start with levelling a sub-floor and then pour a complete durable cob floor. 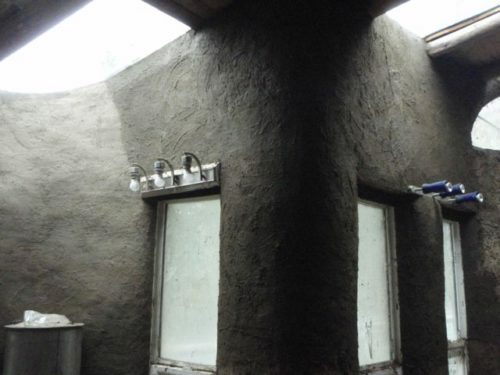 While it dries, we’ll trim and fill cob walls, then make our own mixes of cob plaster and a finish plaster using clay and cow manure. We’ll have fun experimenting with texture and see the difference between a base layer and a finish layer of plaster. A natural paint will top it all off. Then we’ll get at least one layer of floor hardener/sealant on. Come and let your creative side have fun! It all begins on Thursday evening (May 17) with a welcoming wholesome dinner and ends with lunch on Monday before you depart on the 4pm ferry. Every workshop day, we start with a meditative building session, followed by a hot, hearty breakfast. Two longer hands-on learning sessions sandwich a hot vegetarian lunch. Two snack breaks make sure we have the strength and stamina to absorb all the learning we can before we break to clean up and enjoy a delicious dinner. The cost of the 5 day workshop over the May Long Weekend is reduced to $497 (a $200 savings!) which covers all meals (3 hot vegan/vegetarian meals prepared for you for each of the 3 full workshop days, plus a welcoming dinner and breakfast and a good-bye lunch on the final day), on-site camping, hot showers, and hands-on instruction. « The Cob Builders Handbook - sale!